E3 has wrapped up, and amidst the Mac, Windows, console and iPhone titles I now want to sacrifice my social life to play, 12 games stood out among the iPhone and iPod touch offerings. A.D.D. features a series of WarioWare-style minigames. A.D.D. 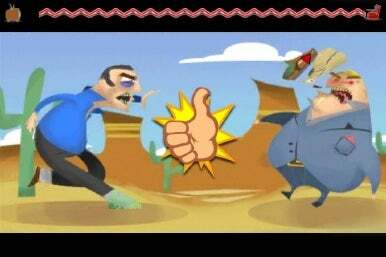 : A "WarioWare"-style casual game for the iPhone, A.D.D will ship with 72 fast-paced minigames (which will be extended to 108 minigames with later updates). Gameplay is rapid, quick, fun and incorporates a demented sense of humor (one mini-game has you shaking salt onto a slug). Simple, good and fun, the title should appear later this summer and retail in the $4 to $5 range. Lordi for the iPhone: An upcoming title by Finnish developer minestudios, Lordi centers around Finnish death metal band Lordi and places the player in a "Silent Hill"-esque scenario where they wake up in a hospital as a school girl and must flee assorted monsters. This is turned on its head in later levels when players become Lordi and are able to hunt down and tear the monsters apart at will. Minestudios has stated that the company will release a total of seven episodes within the game, the full package taking up less than 500 megabytes of space on the iPhone, the title should ship within a few months and retail for about $4 on the App Store. 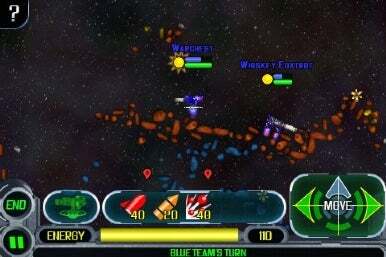 Star Hogs brings turn-based space strategy to the iPhone. Star Hogs: A turn-based space game complete with 32 levels, free play, great graphics, multiplayer support (up to 4 players), Campaign play and one of the best uses of 3D to date for the iPhone. Developer Iugo is about to submit the title to the App Store for review, but it's guessed that the game will be available later this summer and be available in the $3 to $4 range. Tetris Friends: When we met with Tetris creator and gaming legend Alexy Pajitnov and asked him what he was up to with the future of Tetris, he merely sat back, grinned ear to ear and stated "We have pretentious plans" in a thick Russian accent. Pajitnov and the people of The Tetris Company then went on to describe Tetris Friends, an upcoming title for the iPhone that will allow for online matchmaking, participation in the Tetris Cut and a wider form of multiplayer Tetris. No price or release date has been announced as of yet, but it'll be interesting to see where the classic goes from here on the iPhone. Robocalypse: A real-time strategy title with just about everything on the ball, Robocalypse functions as the iPhone port of the Nintendo DS title wherein a batch of robots with the brains of World War II veterans that must defeat a group of machines. The game features upgraded graphics and user interface features from the Nintendo DS version, the controls feel quick and responsive and players can switch between and lock in on both landscape and horizontal view modes. The product will be available via the App Store at the end of August and developer Vogster is currently sorting out the price point for the title. The Sims 3: The iPhone adaptation of the best-selling game, this title allows you to control the lives of your Sims such as working, eating, cooking, bathing, advancing in careers, etc. Functions as a more streamlined version of the full game and you won't be able to use multiple Sims, make bigger purchases like houses and cars or go through life stages, but it's a good experience. The Sims 3 is available via EA Mobile and just went up at the App Store at the marquee price of $10. 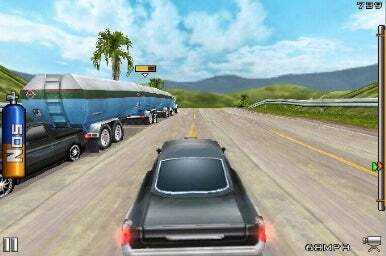 Fast & Furious is a car racing game based on the popular movie. Fast & Furious: Honestly, I liked this more than I thought I would and the title sports good physics/sensitivity and neat features for a racing game (including good multiplayer support, something being at stake given that you can actually lose your customized car to another player and have to rebuild from scratch, your best races can be quickly uploaded to YouTube and you can "ghost race" against the best race uploaded to YouTube to compete against it). Developer I-Play's Fast & Furious is available now for $6. Castle of Magic: Due at the end of June, Castle of Magic is a mixed 2D/3D platform title that challenges the player to explore 5 worlds and 15 subworlds function in your quest to defeat the evil wizard Nefastax. The controls felt as responsive as they needed to be, the graphics and sound proved terrific and this should be worth the $6 App Store asking price that Gameloft is asking for it. Baseball Slugger: Perhaps the most surprising and fully featured of the titles I got to demo, Com2us' Baseball Slugger functions as a competitive home run derby game complete with Wi-Fi multiplayer gameplay, custom avatar, and unlockable equipment and items. The game supports 3G, EDGE and Wi-Fi networks, features great graphics, good sound and it's easy to find an opponent to play against. The title is currently in development and its price has yet to be finalized. Editor's note: Updated information on availability of Fast & Furious.